Well well, Benedict Cumberbatch has really moved up in the world, hasn’t he? He’ll always be Sherlock to me, but you have to admit that when it comes to his skills in acting, he has a very interesting and impressive range to him. The Imitation Game isn’t too different from his role as Sherlock Holmes…in fact, you can sort of see how they picked him for the role, but as its own thing…it’s a very interesting and eye-opening movie in some regards. 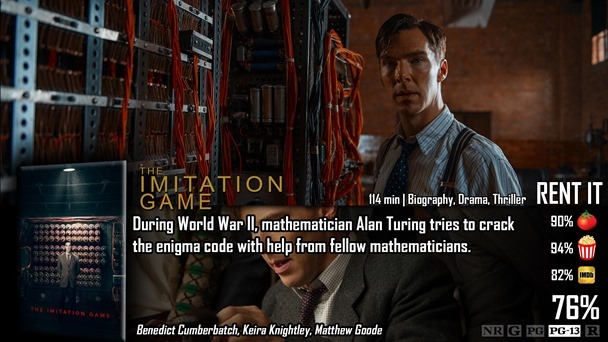 The Imitation Game stars Benedict Cumberbatch as Alan Turing, a brilliant mathematician that was called to serve in a top secret mission to crack a German encryption device and ultimately end World War II. To do that, he has a grand plan to build an impossible machine that would basically do all the work for them if they could find just one part of the code as a starting point. Or, look at it this way, Alan Turning is one of the two mathematicians who people often consider invented the computer. This is more or less – about that. I really do like this film, because even as a historical and biographical film, it serves an absolutely solid plot that any other normal film would portray at the same time. They need to create something impossible to solve something impossible within a set time…and this happened in real life. That’s amazing all in itself, and if that wasn’t good enough, it also serves as social commentary on a lot of things that are currently very important and even controversial. The way that these things are presented in this film is very appreciated and even heartwarming. In short, that’s why I liked it. Now, there are a few things I would have preferred the movie do as far as writing goes. In the beginning of the film, Alan decides to make his “Christopher” machine, and there are these montages of him coming up with algorithms and maybe even other epiphanies…but we aren’t ever given any insight to how he’s coming up with the designs and algorithms. I don’t care what the algorithms are, just how he came up with them. The Enigma device is just that – an enigma – and the audience just has to accept that he’s known all along how to make this anti-engima machine? That’s fine…just give us a little insight into what’s going on in that little brain of his! Rant over. I get it, it’s not really about the cryptology of the thing, or even about math. Sure, there are bits and pieces here where you as the audience want to cheer for this group of geniuses for the way their brains work, but what this film was really, truly about – was Alan Turing’s life and relationships he had with other people – and how those people viewed his peculiar way of living. I personally didn’t know too much about this guy’s life before watching it – so I wasn’t spoiled at all. The entire story was new to me, and because of that, I think I may have enjoyed it more than others. The Imitation Game is a really great film for a lot of reasons. 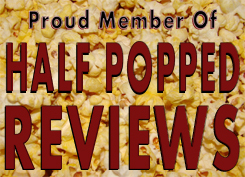 As a historical, biographical drama, it does very well at seeming like a normal movie. As a character piece, it does a very good job at portraying human emotion, personal opinions and judgments, and social commentary that affects people even now for matters that have always been important. I won’t say this was my favorite film of 2014. It’s not really boring, but it’s also not really perfect. It’s somewhere in-between. I’m glad I saw it, and that’s that. It’s another one of those stuffy, by-the-numbers biopics that the Academy usually seems to love and adore. Which doesn’t mean it’s bad, it’s just that it could have been better had they decided to shake things up a tad bit with its story-progression. Good review Dave. I liked this more than usual, just because it had a solid plot – which is unusual for biopics.